Mark Pritchard joins Central Chambers after completing his pupillage at Garden Court North Chambers in Manchester. Mark’s pupillage focused primarily on criminal defence and civil liberties work. 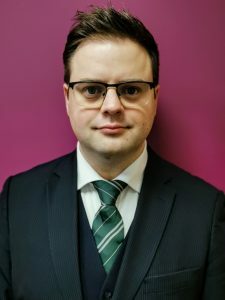 Prior to coming to the Bar, Mark has worked as an associate lecturer-in-law at Manchester Metropolitan University and has also spent many years in various roles within the NHS and Her Majesty’s Courts and Tribunals Service. Mark has experience of conducting hearings within both the Crown Court and Magistrates’ Court. Following his work in the NHS, Mark has developed a particular passion for representing clients who suffer from mental health and substance misuse issues. He enjoys a varied criminal practice and has experience in dealing with a wide range of road traffic matters. Mark Pritchard has significant experience in defending clients exercising their freedom of speech and protest rights. Mark has demonstrated the ability to successfully deploy novel legal arguments in such cases and is one of very few counsel in the North of England to regularly accept instruction in such cases. Due to his experience working within mental health services, Mark is able to accept instructions in the Mental Health Review Tribunal and in prison law matters. Mark Pritchard is a member of Inquest and is willing to take instructions for cases in the Coroner’s Court. He has undertaken work in the Immigration and Asylum Chamber and has had particular success in complex immigration bail applications. During pupillage, Mark conducted several pro-bono hearings for the charity Bail for Immigration Detainees. He also accepts instructions in family proceedings and has particular knowledge of cases involving the deprivation of liberty of adults deemed to lack capacity. Mark Pritchard has acted as a mediator in employment matters and accepts instructions within the Employment Appeals Tribunal.